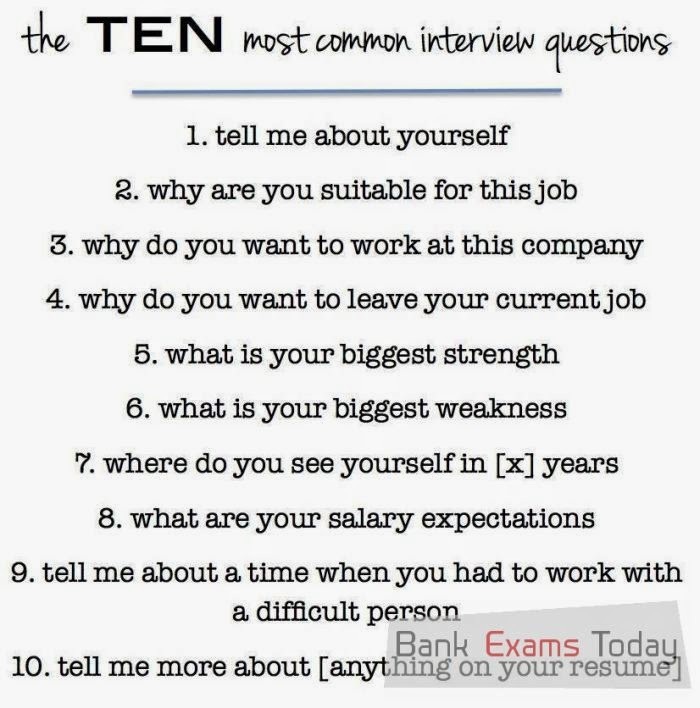 In most of the bank interviews same questions are repeated. Today I am going to list down and answer these repetitive questions. Ans - It should something unique. Analyse yourself. Try to know what you do better than others. Ques 2 - Why are you suitable for this job ? Ans - I am honest and hard-working. You are appearing for interview because you are eligible for it, so don't repeat this stupid line. Every employer looks for an honest and hard working. Ques 3 - Why do you want to work at this company ? Ans - This is the right place to give desired shape to my career. Ques 4 - Why do you want to leave your current job ? Ans - Now this is the most difficult question. You can't say that I hate my boss. Best answer should - Their positions are not compatible with my skills and qualifications. Ques 5,6 - What is your biggest strength and weakness ? Ans - Answer it yourself. It should not be repetitive like - I am honest or I love to work in a team. Ques 7 - What are your salary expectations ? Ans - PSU banks are not going to ask this. So you can skip this for now. Ques 8 - Where do you see yourself in next 5 years ? Ans - It should be realistic, like, I want to be at place of my boss after 5 years. Ques 9 - Tell me about a time when you had to work with a difficult person ? Ans - It is very difficult to work with a short-tempered boss. Ans - It's time to explore yourself. Ibps ke Interview me jabtk Dhabhli nhi ruke ga tbtk kuch nhi hone wala.Ibps wale sab chor hai. Agr interview exam ki jach ho jaya to sab pta lag jayaga. Thanku so much sir for tell us these interview questions.